Welcome to Mahindra Comviva and AITE Group Research on the state of the digital payments industry. It’s no secret that mobile wallets are the most dominant trend in the payments industry today. But how are various ecosystem players such as Banks, OEMs, Mobile Network Operators, Card Network Providers, Merchants and Third Party Providers capitalizing on this trend? And how is the industry leveraging the tsunami of forces unleashed by mobility, growing smartphone penetration, increasing internet access and rising adoption of technologies such as NFC, HCE, BLE and QR Codes? 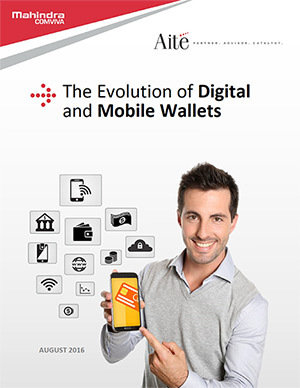 A new study by Mahindra Comviva and AITE Research charts the progress and evolution of mobile wallets and also provides a glimpse of the future of mobile payments.